Jack Phang Investment: Good News for those who are traveling in between JB and SG! Good News for those who are traveling in between JB and SG! Today morning I was shocked to see the newspaper - Zao Bao that the proposed Thompson Route will be completed within 7 years. 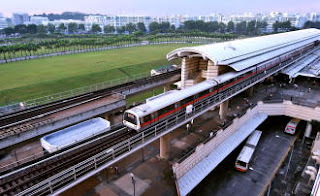 More exciting part is that, the proposed MRT route will be connected to JB (Perhaps Tanjung Puteri and the terminal is at Kempas which is more near to my hometown - Kangkar Pulai). As travelers who travels in between JB and Singapore, it is a very good news to us. Peter Lim, ex-remisier in Singapore just acquired a land near to Stulang Laut and proposed to build a healthcare center. I believe it is time Iskandar Malaysia Authorities to build more facilities in this area to benefit both Singapore and Malaysia citizens. so that we can start looking at Singapore private properties with more reasonable prices. I sincerely hope that Iskandar Malaysia can be connected smoothly with Singapore to create win-win situation to both countries. Let's cheers and hopefully we can see a huge metropolis in Iskandar-Singapore-Bintan/Batam region.